‘Clubfoot se Jeet ka Jashan’ is an annual event which Indus Health Network (IHN) holds to celebrate the successful completion of the clubfoot treatment program. The event was held at Korangi Campus on December 29, 2018. Dr Abdul Bari Khan, Chief Executive Officer, IHN; Dr Amin Chinoy, Executive Director, Physical and Rehabilitation Directorate, IHN and other doctors, orthotists, and physiotherapists attended the event. The program started with the recitation of the holy Quran and followed by speeches. Young patients and their families attended the program. During the program doctors and other experts enlightened the audience about the deformity. Clubfoot or Congenital Talipes Equinovarus (CTEV) is a condition in which a newborn’s foot or feet are rotated internally at the ankle. The ratio of incidence is 1 in every 1000 live births and it is one of the most common birth defects. In 50 percent of cases, both feet are affected. Clubfoot cannot be corrected without treatment. Leaving the foot untreated, increases the risk of complications later in life. Clubfoot’s cause is unknown. The defect appears to be familial and males are twice as likely as females to be born with clubfoot. According to an estimate, approximately 5,400 children in Pakistan are born with clubfoot every year but only a minority of them receive proper treatment. Earlier surgical intervention was considered the only treatment option, however, the concept has recently changed. Ponseti technique is the latest treatment method which involves a series of plaster applications. The total duration of treatment is four years. Ponseti technique doesn’t require any major surgery and the child does not need to be admitted in the hospital. 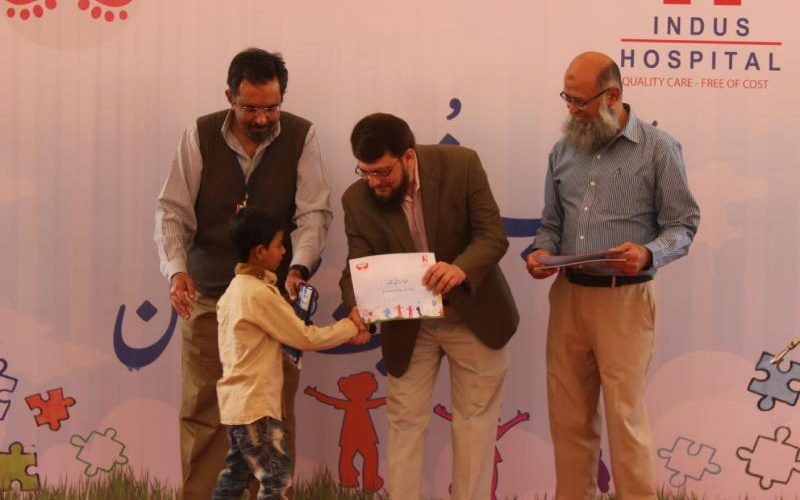 In 2011, The Indus Hospital launched a service delivery program Pehla Qadam (PQ) in collaboration with Amer Haider Charitable Foundation and Interactive Research and Development (IRD) to treat children with clubfoot through the Ponseti method. The center receives patients from all over the country. In 2017, PQ expanded its services in Lahore and Muzaffargarh. So far, more than 1200 children have been under treatment in PQ. More than 12,000 casts (a bandage stiffened with plaster of Paris) have been applied, around 1,000 tenotomies (releasing of a tendon by a small surgical cut) have been done and more than 1,000 children have progressed to braces (special shoes designed specifically for clubfoot). More than 160 children out of these have successfully completed the four-year Ponseti protocol and are now leading normal lives. IHN spends approximately $250 on each patient. The treatment is absolutely free and has been done with the help of Amer Haider Charitable Foundation. During 2014-16, with the support of University of Iowa, USA, IHN organized a capacity building program to train Orthopaedic Surgeons from all over Pakistan and more than 50 Orthopaedic Surgeons were trained by the champions of the Ponseti method: Prof Muhammad Amin Chinoy; Dr Mansoor Ali Khan; and Prof Anisuddin Bhatti. PQ program envisages a Clubfoot-free Pakistan in future through the endeavors of its philanthropists and the dedication of its focused team.